Set along the oceanfront, this shingle-styled custom home is a flipped plan, where the main living and entertaining occurs on the second floor. The client chose this layout to view the breakers on the ocean beyond the lagoon and on-site golf course. The first level is dedicated to guests providing spa-like bedrooms and bathrooms and a secondary living room, which doubles as a theatre. The third floor is the couple's cozy apartment with vaulted bedroom ceiling and half circular window framing their personal ocean view, which leads out to a private balcony. 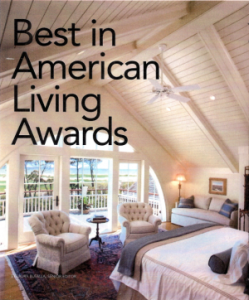 Designer/Architect: Christopher Rose Architects, Johns Island, S.C. Builder: Buffington Homes, L.P., Seabrook Island, S.C. Interior Designer: Cheryl Womack Interiors, Atlanta, Ga. Developer: Kiawah Development Partners, Charleston, S.C.
Land Planner: T Hunter McEaddy Landscape Architect, Charleston, S.C.